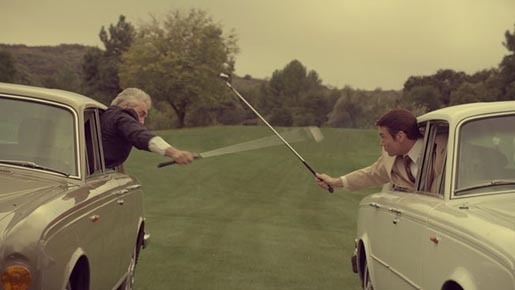 The Chase ad was developed at Crispin Porter & Bogusky by executive creative director Jason Gaboriau, worldwide creative director Rob Reilly, creative directors Robin Fitzgerald and Cameron Harris, associate creative director/art director Mike Kohlbecker, associate creative director/copywriter Alexandra Sann, art director Tusher Date, copywriter Jamie Toal, integrated head of interactive production Ivan Perez-Armendariz, integrated head of video Chad Hopenwasser, executive integrated producer Aymi Beltramo, senior integrated producer Katie Porter, group content director Kate Frazier, content management supervisor Laura Likos, content supervisor Spencer Holmes, content manager Eric Alexander, and business affairs director Rebecca Williams. Filming was shot by director Bryan Buckley via Hungry Man with executive producers Mino Jarjoura, Kevin Byrne, Dan Duffy, production supervisor Josh Rothfield, production designer David Skinner, director of photography Scott Henriksen. Editor was Jay Nelson at Cut + Run, Los Angeles, by editor Jay Nelson, assistant editor Russell August Anderson, second assistant editor Brook Rupe, producers Christie Price and Carr Schilling, managing director Michelle Burke. Visual effects were produced at The Mill by executive producer Sue Troyan, producer Jess Ambrose, VFX supervisors Phil Crowe and Kathy Siegel, VFX creative director Phil Crowe, 2D lead artist Narbeh Mardirossian, 3D lead artist Adam Carroll, 3D artists Durfor, Mike Maker, Mike Dinocco, Martin Rivera, Blake Sullivan, 2D artists Gareth Parr, Adam Lambert, Jim HIllin, 2D artist assistants Margolit Steiner, Steve Miller, Patrick Munoz, matte painters Andy Wheater and Shannan Burkley. Animation was done at Iron Claw by producer Greg Talmage, creative director Sean Koriakin and animator Louis Vega. Sound was designed at Machine Head by sound designer Stephen Fletcher Dewey and executive producer Patty Chow Dewey. Sound was mixed at Lime Studios by audio engineers Mark Meyuhas and Dave Wagg, assistant audio engineer Matt Miller and executive producer Jessica Locke. Music is “String Quintet in E” by Boccherini, produced at JSM Music, by creative director Joel Simon, executive producer/composer Joel Simon, executive producer Ross Hopman, composers Doug Katsaros and Koki Saito.